I have always loved going to weddings. Weddings are such a happy time because everyone is celebrating love. However, throughout the years, I have liked weddings for different reasons. Right now, it’s about celebrating love and no one is really sad, but when I was a child, I used to like to go to weddings to see the bride all dressed up and the most important part… THE CAKE. Some of you might know that Asians typically don’t like really sweet desserts. Most of the desserts you see from Asian restaurants are red bean soup or maybe nothing at all. But for Asian weddings, there is still cake. It is like a very airy and tasty sponge cake. It’s not very sweet, but it typically does have strawberries and a very creamy and airy whipped cream frosting. I always looked forward to having this kind of cake at weddings (or my parents would buy it for my grandparent’s birthdays). It tastes so good. When I found this recipe on Table for Two’s blog, I knew I had to try it. I brought it to D-‘s family in So Cal and they loved it. I decided to make it into cupcake form to make it more travel-friendly and I thought it turned out pretty cute! 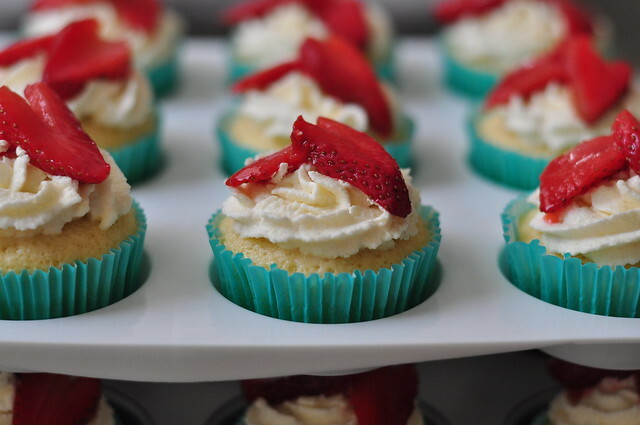 This entry was posted in Cupcakes, Recipes and tagged baking, cupcakes, desserts, recipes, strawberries on July 14, 2013 by Krystal.